RN Kim uses the Ellman Surgitron to cosmetically remove an unwanted benign mole. This is a quick procedure which is performed under local anaesthetic which entails a small needle injection to numb the area first. Benign non-suspicious moles can be cosmetically removed with Ellman Surgitron radiowave therapy. This treatment ensures minimal to no scarring, making it a great option for highly visible moles on the face and body. Skin tags are benign skin growths that can be simply annoying, visually displeasing, or even painful depending on the location. Skin tags grow anywhere on the body, but often are located in the armpit, groin, on the neck, at the bra-line or in breast folds, which can rub on clothing or jewellery causing irritation and bleeding. Skin tags can also be cosmetically removed with Ellman Surgitron radiowave therapy. See also skin consultation, skin preparation and aftercare. A seborrhoeic keratosis (seb k) is a benign lesion that is often referred to as a wisdom spot, barnacle, waxy wart, senile wart, or basal cell papilloma. Seborrhoeic keratoses are common in adults and often darken and enlarge over time. They can be removed for cosmetic purposes with Ellman Surgitron radiowave therapy leaving minimal scarring and in some cases no visible scarring at all which makes the Ellman Surgitron a cosmetically pleasing treatment for seborrheic keratoses on the face, neck, or décolletage area. 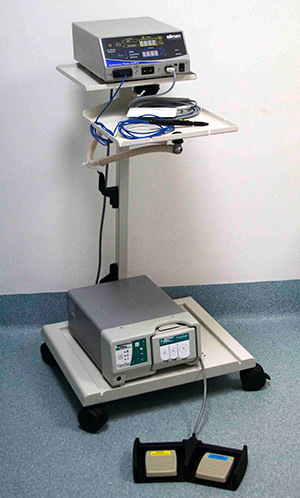 The Ellman Surgitron uses high frequency radiowaves to perform surgical procedures such as skin incisions as well as hair removal by electrolysis. Seborrheic keratoses are also known as seborrheic verruca and may present as just one lesion, although typically they occur in clusters. They are usually mid to dark brown but can vary in colour from light tan to black. They also vary in size from a few millimeters in diameter to larger than two centimeters. Skin HQ uses the Ellman Surgitron which is an advanced radiofrequency electrosurgical system designed, developed, and manufactured in New York, USA. The Surgitron Dual EMC 90 has a variety of applications from cutting and cauterising tissue to electrolysis and is optimised for limiting damage to the surrounding skin while effectively treating benign skin growths and fine hair.